To thrive under the pressure from e-commerce disruptors, brick-and-mortar stores need to offer new types of experiences and innovations. This means both in-store processes and in-store experiences need to be digitalized. To achieve this, solid in-store digital platforms are essential, platforms that steer customers and employees efficiently in real time. Let’s take a closer look at a pioneering example in northern Italy. It might not come as a surprise that the land of food passion is also leading the way in taking on these challenges and innovating the grocery shopping experience. In the Milanese neighborhood of Bicocca, Italy’s largest supermarket chain, Coop, has launched the “Store of the Future”. As a testing ground for the latest innovation in retail shopping, Coop Lombardia wants to offer new generations of shoppers a more connected, exciting and sustainable shopping experience. The store, co-engineered by Accenture, uses Pricer technology to enable innovating solutions for real-time customer interaction, shelf management, and the optimization of the in-store customer journey. For Coop, the decision to implement Pricer technology has been a strategic, long-term decision in order to create a more positive customer experience and open up new ways of marketing. 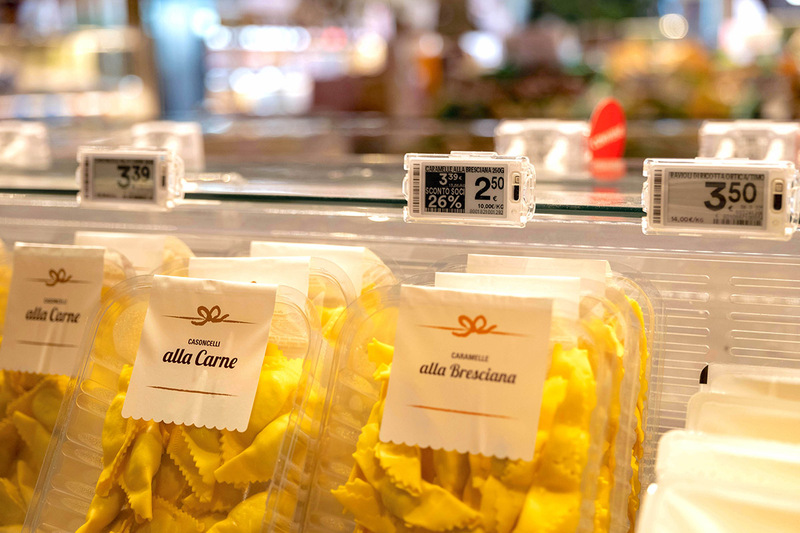 The core of the Pricer system at the Coop Bicocca store is the optical wireless communication platform and electronic shelf labels that use E-paper graphic displays. This enables real-time communication with the labels, which is ten times faster than competing technologies and has 100 times less energy consumption. With this future-proof platform, Coop can easily activate new services to the solution without having to change the existing hardware infrastructure. The Pricer system in the Bicocca store covers a range of functionalities, helping owners and store staff with store operations and tasks, as well as supporting shoppers in order to maximize the shopping experience. Some of these functionalities are being used for the first time ever in an Italian store. 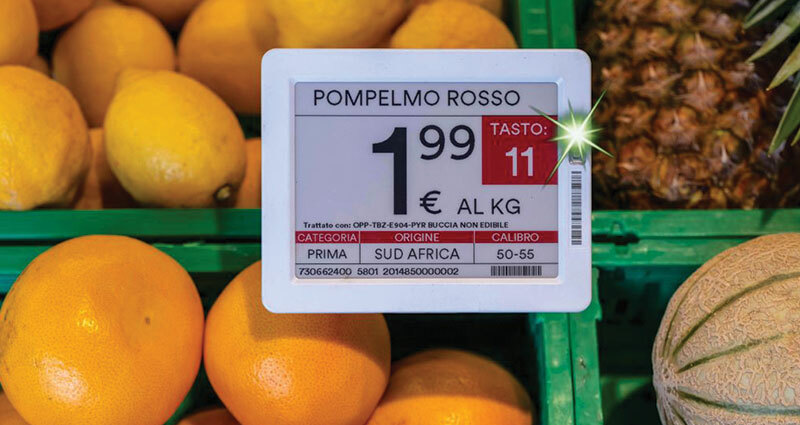 With the Real-Time Flash from Pricer, the labels offer visual flashes that help with in-store processes such as product positioning, “out of stock” signals and visual notifications for expiring products. The solution also works in reverse, allowing store staff to easily scan a product and get the correct location for it, as well as see visual indications from a real-time, built-in flash, ensuring action on the correct product. This improves efficiency by up to 80 percent. It also makes it easier for less experienced employees. With the advanced Click & Collect functionality, store staff can locate products on their list and receive flashing alerts when they are close to the shelf, which reduces the time needed to collect the right items by up to 74%, as well as minimizing errors. With the Quick Search functionality from Pricer, the store can guide employees and customers to the right items more efficiently using a store map and guiding instructions directly on their mobile phones, PDAs or the in-store digital kiosks. The functionality also integrates with other applications and can offer additional information such as product availability and sales offerings, ensuring an omnichannel customer experience. Core functionality from Pricer enables the store to easily update product information in real time with, for example, the latest delivery, reviews and stocking data. This is functionality that is highly relevant for Coop Lombardia in Bicocca as they have a strong focus on product information and meeting the growing demand from customers who want to know more about the products they buy. The effective collaboration between Coop, Accenture and Pricer has contributed to a store that really stands out in both the region and the country. It has become a global reference point for the next generation of retail experiences. And for those who want to follow the same journey as Coop Lombardia, there has never been a better time. Right now, there are powerful state incentives on offer for Italian stores that want to participate in a real digital transformation. For almost three decades, Pricer has been an innovator and leader in transforming the in-store customer journey and optimizing store management with its in-store digital solutions. With a Swedish origin, Pricer now serves leading retail chains around the world with more than 190 million labels, enabling an average of 5 300 updates every second. By using a proprietary patented technology that is 900 times faster than competing technologies, Pricer can offer reliable and effective two-way communication that helps stores offer better customer experiences and use their resources more efficiently. The ESL system works without interruptions anywhere in the store and its patented technology provides best-in-class durability. For more information, feel free to contact us at Pricer. Over 400 stores installed Over 7 million labels installed Hypermarkets (megastores), supermarkets & convenience stores Supermarket chain Casino was one of the first retailers to understand the total value of electronic shelf labeling, implementing from day one stock information directly at the shelf edge.